I came across an offer that I think is pretty amazing, and I wanted to share it! It’s for a free patterned Udder Covers nursing cover from UdderCovers.com (really!!) where all you have to do is pay for the shipping! Such an amazing deal if you need one for yourself or to give as a gift! I didn’t have any kind of nursing cover with Leah and it was always a challenge trying to cover up with just a regular old receiving blanket. I would have loved one of these! And then when I had Kate almost a year ago now, I bought a Bebe au Lait nursing cover. I LOVED it, but it was pricey – I think I paid $39.99 at a specialty baby boutique. I used it to cover up at tons of family events and restaurants! I found it so useful to have a nursing cover and I would have gotten myself 3 of these free nursing covers if this offer was on a year ago! (lol I have a habit of jumping on these kinds of deals!). It even says the nursing cover has an adjustable strap and a rigid neckline built in so you can adjust it and keep an eye on your baby, just like the Bebe au Lait, which is awesome! Plus the patterns they have look really cute! 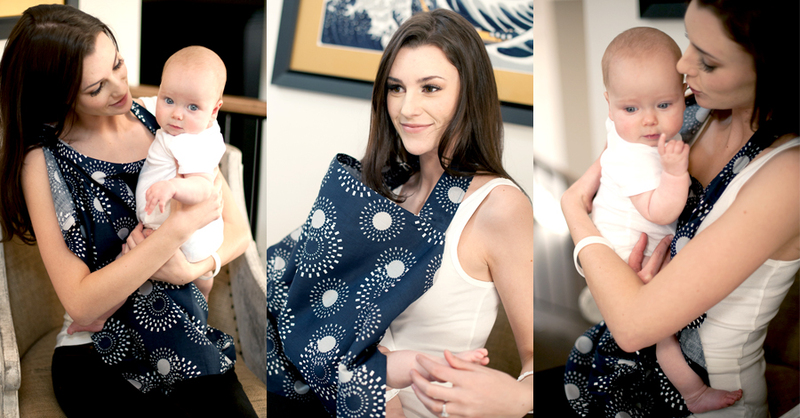 The fabric of the Udder Cover is lightweight and 100% cotton. It’s heavy enough to keep your modesty, but light enough that your baby shouldn’t get hot underneath it, even in the summer. And all you have to pay are the shipping costs, which are maybe $8-$12 within America and probably a few dollars more to other countries. I’m not sure how long this offer will be on for, but I’ll remove this post when I see that it’s no longer available. You can click the banner above to see the super cute fabric patterns they have. Click “Shop Now”, select any cover you want and you will be directed to the “shopping bag” where you can enter the promo code “ENBABY”. This promo code will take 100% off the nursing cover purchase and all you have to pay for are the shipping costs! You can even use the code more than once if you open another browser window! Such a great deal! So sweet! Thanks. I just stumbled across your blog because I have been trying to decide whether or not to order premier prints fabric to make curtains. This is an added bonus! Love your blog and love that it is Canadian too! Thanks! I thought this was such a good deal too! And I definitely recommend premier prints fabric. I just posted my curtain tutorial yesterday, and tomorrow I’m going to post the photos of how the curtains turned out. Love the fabric, just not overly sure about blackout lining! Your curtains turned out great! What makes you unsure about the blackout lining? I am about to order some lining so I was curious what you think about the lining you purchased? There’s nothing really wrong with the lining. It does exactly what it’s supposed to do. I just wasn’t crazy abut how heavy it made the curtains look. Turns out I prefer the way it looks when a little bit of light comes through the fabric. With the blackout lining they kind of end up with that plastic look that hotel room curtains have. Oh, I see! I know what you mean. There is something elegant about the way curtains drape when the light shines through. I like that look too. Thanks for your sharing your thoughts so quickly! No problem! Good luck with your curtains!! I’m sure they’ll turn out beautifully! !